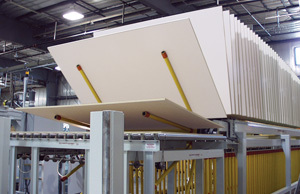 Custom Cooling Systems for Particle Board, MDF, Laminated Panel, Laminated Flooring and other Wood Industry Products – Creative Automation, Inc.
Cooling systems by Creative Automation handle a variety of products including: particle board, MDF, OSB, hardboard, laminated panels and flooring. 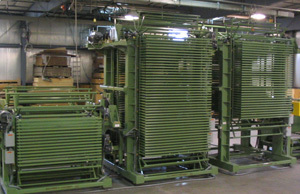 Overall view of a compact cooling system in our facility prior to shipment. Panels were kept horizontal and were accumulated vertically to reduce the footprint. 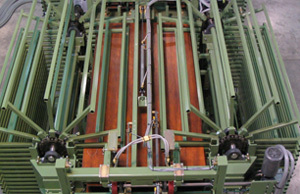 Closeup of the cooling system showing panels in one of the cooling sections.